Helicopter Eela Movie Review: This Film Needed Helicopter Parenting! Home » Reviews » Helicopter Eela Movie Review: This Film Needed Helicopter Parenting! Kajol redeems the dull story with her eccentric performance. What’s Good: There are sequences so half-wit that you actually start having fun with them, Kajol – the only silver lining of this otherwise dull and dark cloud! What’s Bad: The story has no sense! It had a purpose to display Helicopter parenting but instead it ends up covering every other irrelevant thing. Loo Break: Not break, you’ll need loo break(s) while watching this! Watch or Not? : A Star Is Born, First Man, FryDay, AndhaDhun, Aravinda Sametha, Boyz 2 – there’s at least one better option in every language, do you really need to go for this one? Read ahead and decide! Eela (Kajol), a mother who’s obsessed with anything his son Vivan (Riddhi Sen) is connected to. In the start we see Eela getting admission in the same college as Vivan’s. Out of nowhere we are taken to the flashback sequence to see how she was a dreamer. An aspiring singer, Eela of 90s is ready to sing anything even if they’re jingles for television. While riding on a bike with Arun, his boyfriend, she gets down at the vintage Rhythm House and calls it as her ‘Zindagi’. In the entire flashback sequence there are way too many unnecessary cameos of Anu Malik, Mahesh Bhatt, Ila Arun, Baba Sehgal and Alisha Chinai. We see how Eela over a very illogical reason loses her husband and raise Vivan as a single mother. Cut to current scene, we see Eela and Vivan having some issues in the college and how the problems bring them together is what the story is all about. Based on Anand Gandhi’s Gujarati play Beta, Kaagdo, the script of Helicopter Eela has been reworked by Mitesh Shah. From Eela’s ‘dreams do come true’ attitude to being a Helicopter parent and annoying the life out of his son, the script is scattered badly. Touching many different chords, makers compose a not-so-soothing melody. You’ll literally root for the climax because you need to get done with whatever you’re in for. The effort of holding you back to your seats is visible but unfortunately it’s not a successful one. The issues that create misunderstanding between the mother and son are so trivial and that’s where the script fails. Kajol redeems the dull story with her eccentric performance. Had there could’ve been anyone apart from Kajol, things would’ve been worse. She just smile her way in and stay there for the most of the time. Riddhi Sen, a National Award winning actor, is decent with his portrayal of a frustrated son. His emotions are on-point, it’s just with a good script he could’ve done wonders. Tota Roy Chowdhury, for a considerable amount of screen space, does a fair job. Nothing memorable from the rest of the supporting cast. After a remarkable debut with Parineeta, back in 2005, Pradeep Sarkar continues to be your mediocre director. A very chaotic direction as the film leads to nowhere meaningful. Few moments are delightful but that’s all because of Kajol. There should’ve been major changes done in the script in order to focus on one clear thing the makers wanted to say. Even songs by Amit Trivedi fail to save the already sunk ship. Mumma Ki Parchai works well but because of the narration seems forced. Had high hopes from Shilpa Rao’s Chand Lamhe but the way it has been wasted in the film is heartbreaking. All said and done, Helicopter Eela is one boring film with good performances by Kajol and Riddhi Sen. Too much of forced melodrama and annoying character graph of Kajol eats up the fun from the film. It’s a golden opportunity lost! Helicopter Eela Movie releases on 12th October, 2018. Share with us your experience of watching Helicopter Eela Movie . 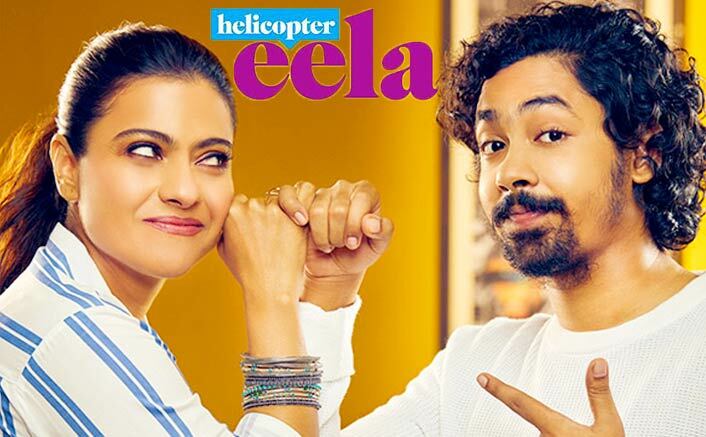 Helicopter Eela Movie Review Quicker: Kajol Remains The Best Thing Of The First Half! Box Office Predictions Of Helicopter Eela, Tumbbad, FryDay & Jalebi!